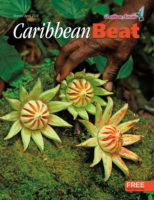 In early 1992, passengers boarding BWIA planes across the Caribbean, South and North America, and Europe found something new in their seat-pockets: a magazine by the name of Caribbean Beat, with the watchful face of a Martiniquan filmmaker on the cover. 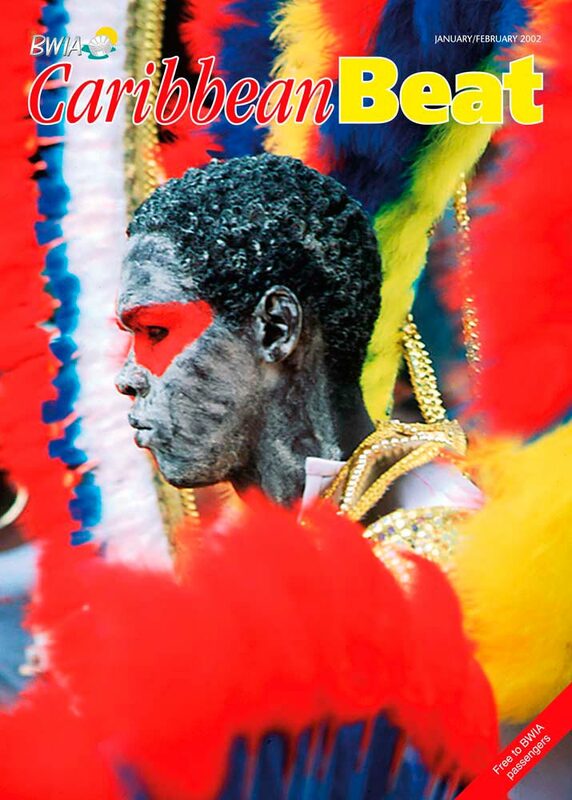 As those early readers turned the magazine’s pages, they discovered a profile of director Euzhan Palcy, a memoir by Trinidad-born broadcaster Trevor McDonald, and previews of the Caribbean’s yearlong Carnival calendar and the upcoming Carifesta arts festival. They found articles on Tobago Sailing Week and a fashion portfolio by some leading Caribbean designers, alongside a thoughtful essay on the state of West Indies cricket and a business report on trade liberalisation across the region. So the key ingredients were all there at the very beginning: Caribbean arts and culture, travel and current affairs, explored from a Caribbean perspective, with a Caribbean audience in mind. Twenty-five years later, so many things have changed. 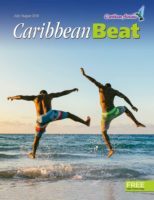 Caribbean Beat’s airline partner, for example: we’re now the official inflight magazine of Caribbean Airlines, celebrating its own tenth anniversary in 2017. The masthead design is different. Originally published quarterly, the magazine has appeared bimonthly since late 1995. Nowadays, our editorial and production process is completely digital: it’s been many years since a writer filed copy via fax, or a photographer turned up with a case of film slides. And the Caribbean region has changed too, in countless ways — social, cultural, political. But some things haven’t changed much at all. 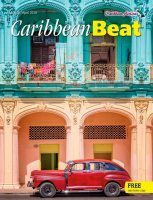 Caribbean Beat is still published from the same small office space in Port of Spain — we prefer to think of it as cosy, rather than cramped — and by a tiny editorial team. (Most of the current editorial staff were schoolchildren back in 1992.) Some of the writers, photographers, and illustrators whose work appeared in our first issues a quarter-century ago are still regular contributors, alongside dozens of others in the bank of talent we’ve built up over the years. 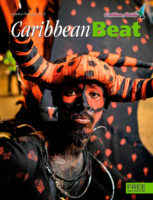 And the contents of the magazine, the words and images that fill our pages, still hold to Caribbean’s Beat’s original brief: to explore and portray the Caribbean as it really is, rich in complexities and contradictions, and to celebrate the best and most brilliant of our people and our culture. 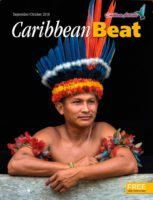 Caribbean Beat has never been a typical inflight magazine — and that’s to the credit of Caribbean Airlines (and BWIA before them). Of course, we’ve covered Caribbean travel from the very beginning, including the beaches, resorts, and festivals that the region is best known for. But we know the Caribbean is much more than that: it’s our writers and artists, our scientists and inventors, our sportsmen and -women, philanthropists and thinkers. The Caribbean is coconut trees and deckchairs, of course, but it’s also skyscrapers and high-tech concert halls, universities and cricket grounds. It’s Jamaica’s lushly forested Cockpit Country and the “blue holes” of Andros in the Bahamas, the stark desertscape of the arid ABC islands and the vast savannahs of Guyana. It’s ruined Mayan pyramids in the jungle of Belize and the Hindu Temple in the Sea in Trinidad. 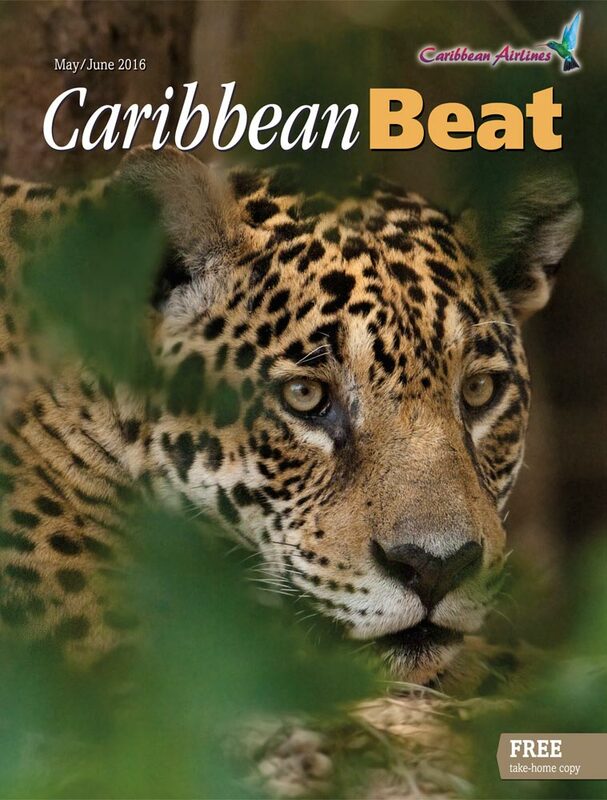 Like the airline that connects the far-flung peoples of the Caribbean region, with our many languages and ethnicities, Caribbean Beat brings together in its pages the diversity of elements that makes our part of the world so fascinating and bewildering. The energy, creativity, and diversity of the Caribbean, formed in the crucible of our history, make us unique. Looking back over the past twenty-five years, we realise how aptly those qualities are represented in the 144 covers we’ve published — as you can see for yourself in the following pages. Here are landscapes familiar and unexpected, the colour and spectacle of festivals, flora, and fauna, the work of artists, the gestures of performance, and above all the faces of Caribbean people, famous or not, reflecting our sheer variousness. So we’ve taken the opportunity of this milestone to revisit the stories behind some of those cover images. Why did we choose those images back then, and what’s happened to their subjects in the intervening years? For this telling panorama, and for Caribbean Beat’s huge (and we think valuable) archive of stories and images, we thank the hundreds of writers, photographers, and artists we’ve worked with over the years. The life of a magazine, behind the scenes, is replete with small thrills, the occasional crisis, and an unending series of deadlines. 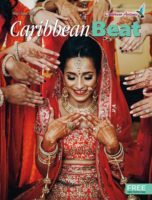 Generations of editorial, sales, and production staff have known that the magazine is only as good as its next issue — and have worked with dedication and imagination to earn Caribbean Beat its reputation as one of the region’s best-informed, best-written, and best-looking magazines. (For the latter, we owe special thanks to Russell Halfhide, Beat’s designer from 1992 to 2007, who gave the magazine its elegant, approachable style at the very beginning.) We’re grateful for Caribbean Airlines’ consistent support, and their belief in the value of a magazine that looks beyond the stereotypes to the real heart of our people and culture. And, of course, we also owe thanks to you, our readers — for your encouragement, suggestions, and even your criticism, which have helped shape our sense of the magazine’s mission. We hope you share our pride in reaching this anniversary — which we commemorate, above all, by simply doing the thing we’ve done for the past quarter-century: imagining what’s possible for the next issue, and the ones after that, and then racing after the deadlines. 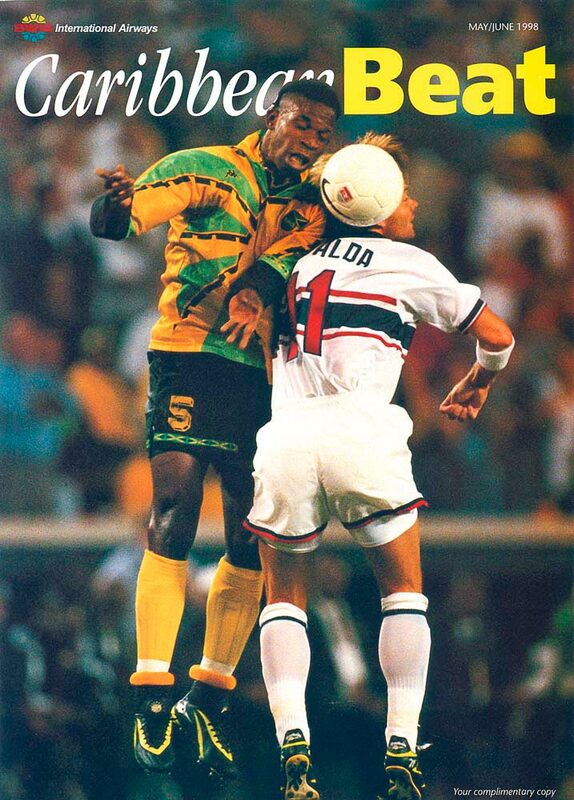 I still have a soft spot for the very first cover we published, back in January 1992. Looking back at it now, it’s hard to see why. The tones are grey, the subject is stiff and formal, and there’s a dated feel to the image. The photo is not even by a Caribbean photographer (in 1992 we could not afford to commission a cover image, and had to make do with a studio PR photo). Since 1992, many of our covers have been more colourful, more appealing, more popular. There have been beaches and boats, beautiful people, landscapes and seascapes, sports heroes, singers, musicians, Carnival people, striking graphics and paintings. I like them all, and feel proud of many of them. 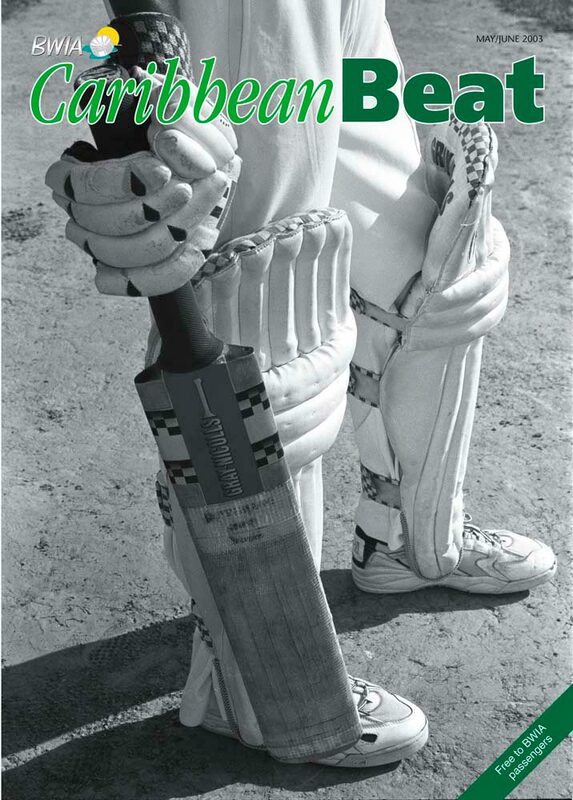 Yet that very first cover somehow managed to announce what Caribbean Beat was going to be all about. 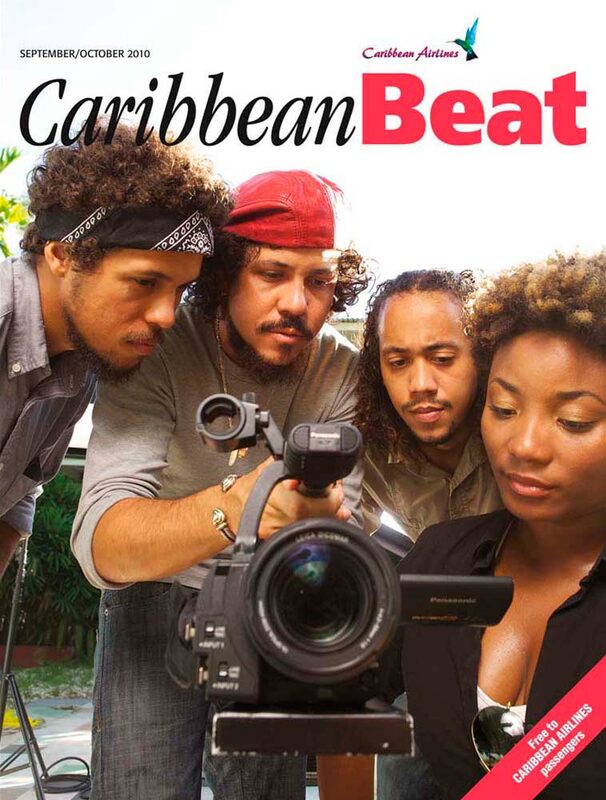 Why (that cover asked) is Caribbean filmmaking not taken seriously? Why do we think of the Caribbean as a romantic backdrop for other people’s movies, not for making our own? 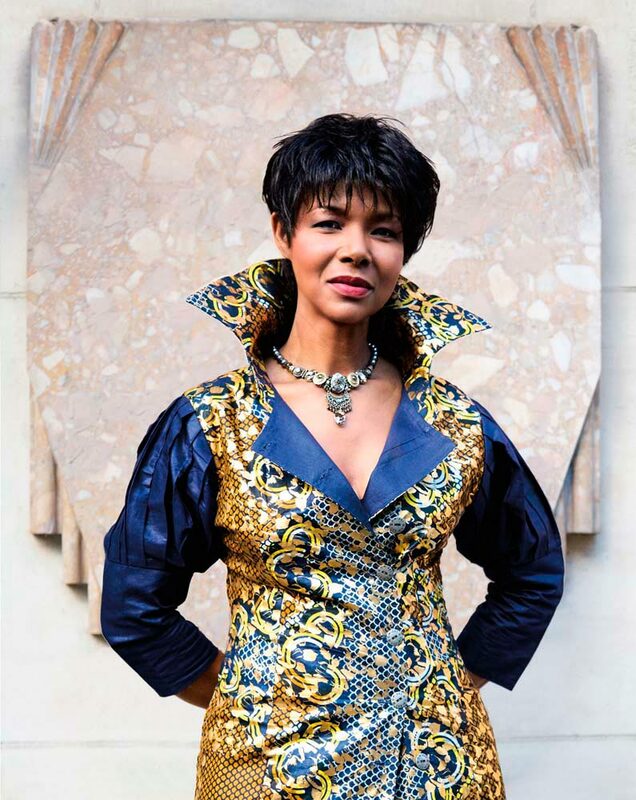 We saw Euzhan Palcy as a formidable Caribbean woman who had broken through ethnic and gender stereotypes into a notoriously difficult industry and had produced some powerful work. She was interested in making Caribbean films, not perpetuating Caribbean stereotypes. It was exactly the sort of achievement that Caribbean Beat wanted to discover and celebrate. 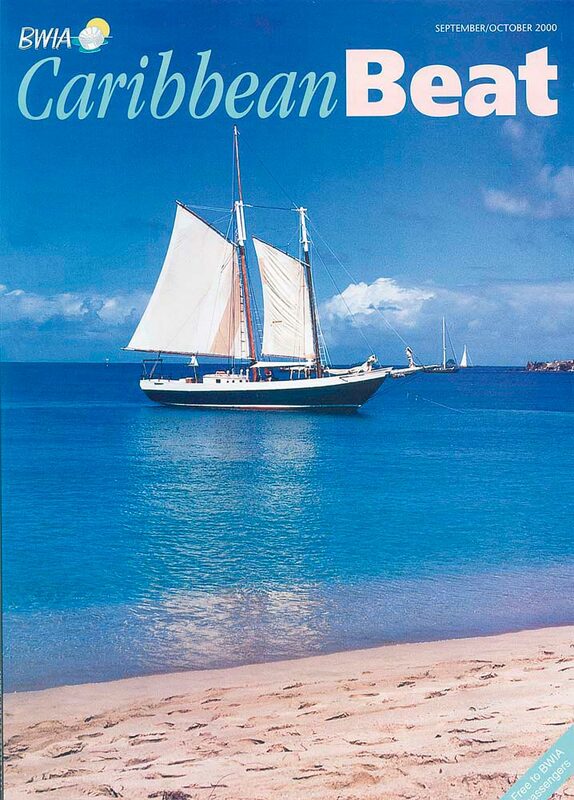 So that very first Caribbean Beat cover did not depict a wonderful golden beach, or a sunset, or a luxurious villa. It made the statement that the Caribbean is more than its beaches, more than rum punch and partying, wonderful and liberating though those pleasures are. The Caribbean is not just a romantic backdrop: it has successes and achievements of its own, world-class people in sport and science, music and business, writing and the visual arts. And we wanted our readers to know about them too. Since then . . . 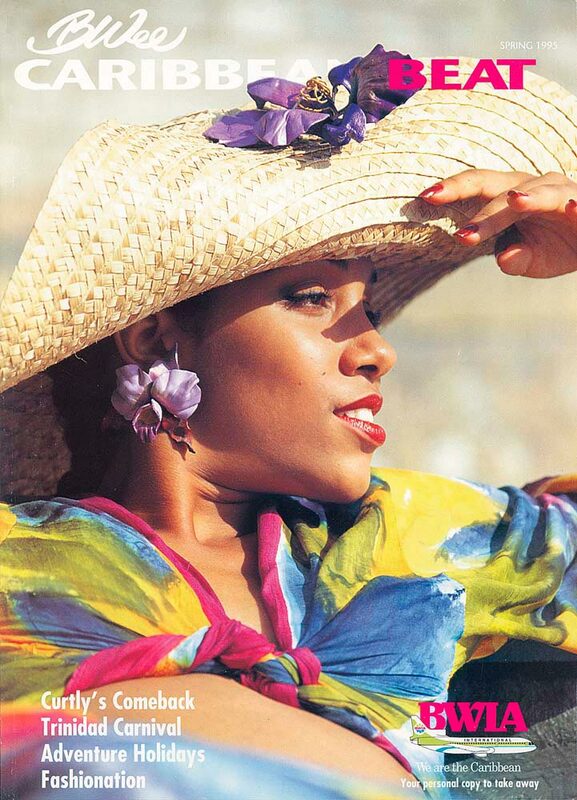 When Euzhan Palcy appeared on the cover of our Spring 1992 issue, she was already, at the age of thirty-four, recognised as an icon of Caribbean filmmaking. Her 1983 debut, Rue Cases Nègres (adapted from Alfred Zobel’s novel), had earned her a César Award — the French equivalent of an Oscar — and a Silver Lion at the Venice Film Festival, plus a dozen other international awards. The screenplay — which she started while still a film student in Paris — had won the admiration of famed French director François Truffaut, and Aimé Césaire, the celebrated Martiniquan poet and mayor of Fort-de-France, had helped secure the production budget. Rue Cases Nègres was a rare example of a film almost immediately recognised as a classic. Despite this early success, Palcy’s second project was six years in the making. The subject she’d set her heart on — an adaptation of South African writer André Brink’s anti-apartheid novel A Dry White Season — proved difficult to raise financial support for. Still, Palcy was determined to make a politically hard-hitting film. She even travelled to South Africa, pretending to be a musician, to research conditions in Soweto. It took some hard lobbying and an unshakeable faith in her creative vision, but she succeeded, securing the juggernaut MGM as producer. A Dry White Season made Palcy the first black woman filmmaker to be produced by a major Hollywood studio, and won another slew of awards, including an Oscar nomination for star Marlon Brando. The film’s success inevitably brought offers, from Hollywood and elsewhere, to work on more “commercial” projects. But Palcy’s sense of political commitment and her resolution to follow her own creative instincts led her, over the years, to turn down many such “opportunities.” “People think, Oh where is she?” Palcy said in a 2015 interview. “She did those movies and she disappeared.” In fact, she’s created a solid body of work that speaks to the range of her concerns, from the culture of her native Martinique to questions of social justice around the world. 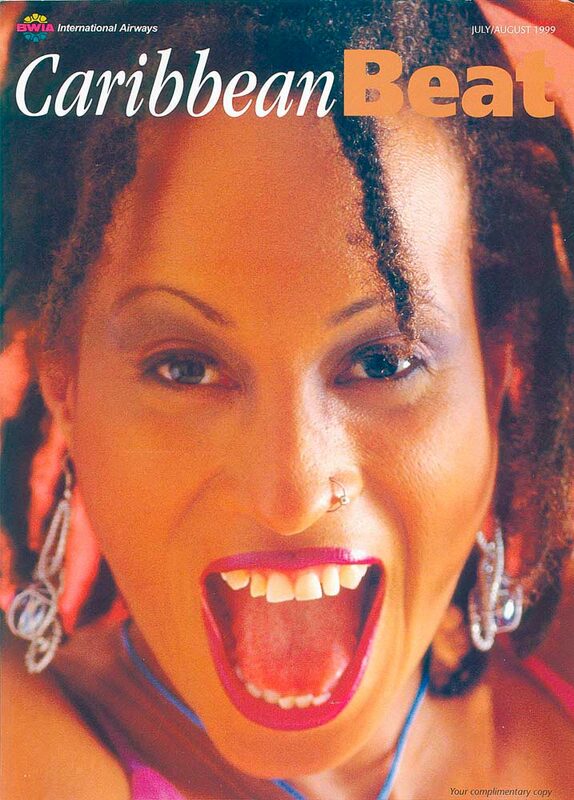 The lighthearted Simeon (1992), set in Martinique and France, tells the tale of zouk music and its impact on the world. Palcy has also made a documentary about Césaire — hero of the Négritude movement, and her own mentor — and another about the young men and women of Martinique who fled the island to join the Free French army during the Second World War. The biographical Ruby Bridges (1998), produced by Disney, is a profile in courage from the US Civil Rights Movement: the story of a six-year-old girl who was the first African-American child to desegregate an all-white school in New Orleans. It was followed by The Killing Yard (2001), about the infamous 1971 Attica prison riot and its effect on the struggle for prison rights in the United States. And Palcy’s magnum opus may be yet to come. For over twenty years, she’s been working on a feature film about Haitian revolutionary hero Toussaint L’Ouverture. 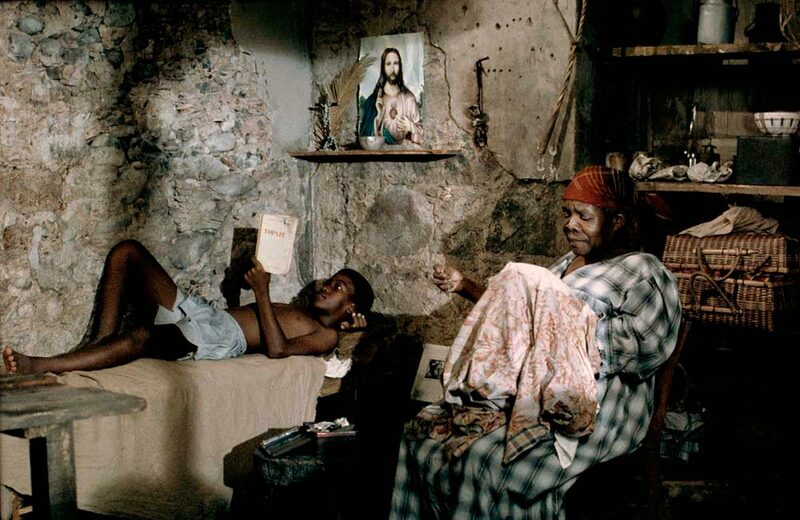 More than two centuries after the Haitian revolution, Toussaint remains a figure both inspiring and deeply controversial, and Palcy is determined to tell his story her way. No surprise, then, that there’ve been setbacks and numerous delays. “I will never compromise in a way that distorts history or hurts my project,” she says. It’s an ethos her successors in the Caribbean film industry can learn from — as much as from her indelible films. A Caribbean rocket launch? 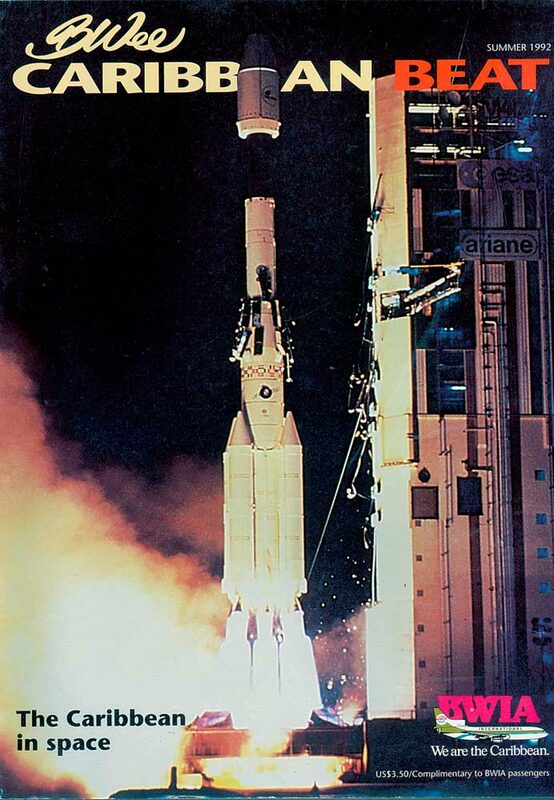 Yes: since 1971 the Centre Spatial Guyanais in Kourou, French Guiana, has been the major launching site for the European space agency, thanks to its location near the equator — where the earth’s spin gives an extra nudge to departing rockets, allowing them to carry a heavier payload. 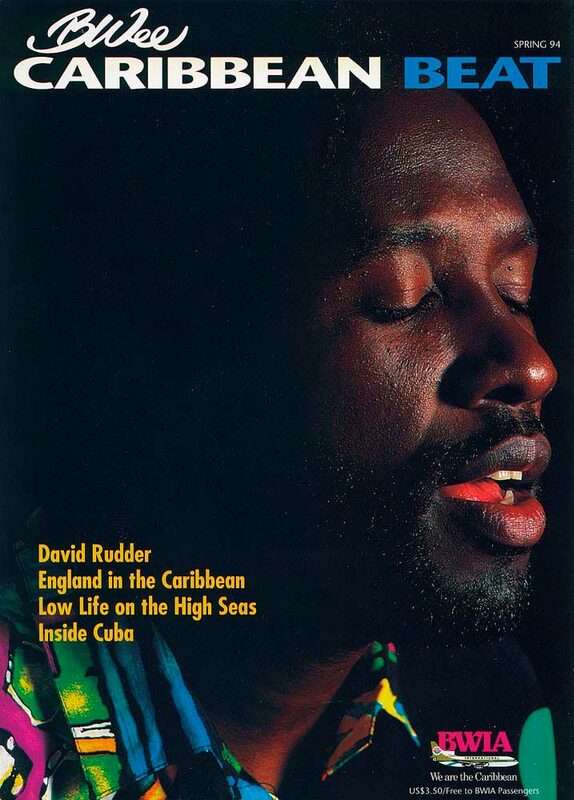 When David Rudder graced the cover of Caribbean Beat in 1994, he’d already been a defining voice of Trinidad and Tobago Carnival for eight years. At that pivotal point of his musical career, calypso fans could look back on the bluesy, soulful soca singer from Charlie’s Roots who in 1986 became the first lead singer from a brass band to capture the national calypso monarch title with “The Hammer”, a tribute to the late, great pan arranger Rudolph Charles, and the “Bahia Girl” with her bouncy Baptist beat. In that moment, he had redefined the calypso stage in much the way the Mighty Sparrow did in the 1950s, making it a daring display of rich, lyrical social commentary with an upbeat, jazzed-up, soca beat. By 1994, Rudder had penned “Rally ’Round the West Indies”, which would become the theme song of the West Indies cricket team. He had songs featured in the Hollywood movie Wild Orchid. And the hits kept coming: “Haiti”, a lyrical lament for the Caribbean nation; “The Engine Room”, a tribute to the percussion side of a steelband; and “Calypso Music”, a joyful history of the art form. By 1995, he had become bolder and more political by offering the album The Lyrics Man, with his distinct brand of calypso rap, including stinging political irony in “Another Day in Paradise”. By 1998, Rudder had climbed to the pinnacle of success with the album Beloved. Projecting a strong sense of history, Rudder crossed musical boundaries and injected a sense of spirituality into Carnival with “High Mas”, a collision of puns that stretched from the Roman Catholic church’s sacred liturgies to the profane street theatre of Carnival. The celebratory experience of Trinidad culture culminated in the title song “Beloved”, a nostalgic look at the island’s soul-filled sense of community. The following year, he addressed the growing ethnic rift perceived by many people in politics and society with a calypso reminding Carnival revellers of their ethnic roots, represented by the rivers that define their history: “The Ganges and the Nile”. Rudder’s career took a new direction when he married and moved to Canada in 2002. That experience would manifest itself the following year in “Trini to the Bone”, a celebration of those roots that ensure Rudder’s connection to Carnival and elevate him to the role of calypso ambassador. Distance has not eroded the legacy of his lasting voice: he’s destined to be remembered as a performer who carved an original place in calypso history. To be the holder of multiple world records — highest individual score in a Test (twice: 375 and 400), in first-class (501), runs in one Test over (28), and the only batsman in first class games to have scored one, two, three, four, and five centuries — is rightfully to be acknowledged as one of the greatest batsmen in cricket history. 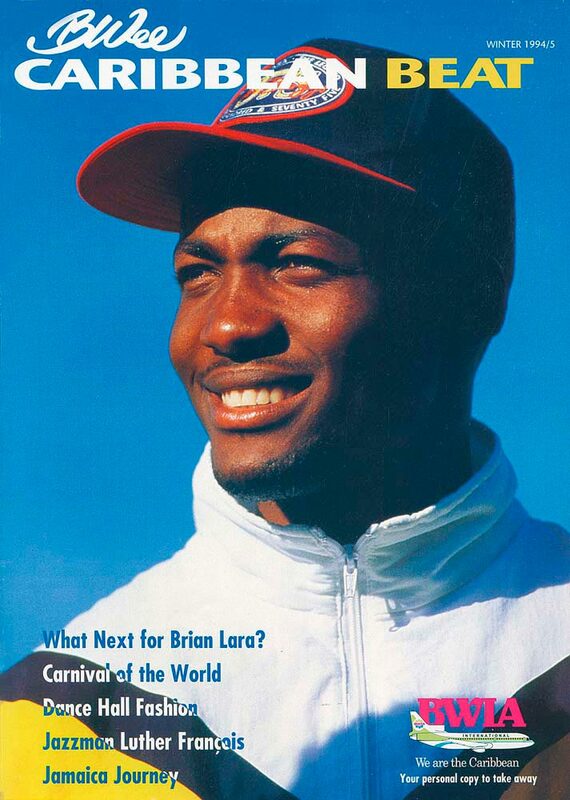 The impact of Brian Charles Lara’s personal achievements was amplified by the circumstances under which he accumulated them. From 1993, when he scored 277 and captured international attention, to his last West Indian appearance in 2007, he was part of a team on an unhappy trajectory towards cricket ignominy. West Indies supporters were regularly crushed by the unrelenting losses, but Lara gave them — gave the world — something that sparkled beyond the gloom. On the field, he embodied greatness, and for West Indian societies, struggling with rampant mediocrity in leadership and politics that was manifest in weak economies, growing crime, and brazen corruption, he was a reminder of the magnificence that has periodically erupted in our history. Lara’s feats were celebrated worldwide, and West Indians were able to bask in that reflected glory. Bestowed with high honours — the Trinity Cross (as it was then known in Trinidad and Tobago), the Order of the Caribbean Community, the Order of Australia — he had a remarkable career that was dogged by difficulty, not least of which was the ongoing adversarial relationship between players and the West Indies Cricket Board. He was named captain of the West Indies team three times, and despite his super status as a batsman, could never claim to be a winning captain like Clive Lloyd or Viv Richards. Instead, he presided over a team with wildly fluctuating fortunes, where victories were few and embarrassments were many, though individual performances were often brilliant. But, in his time, he became one of the first of the breed of wealthy cricketers who brought business savvy to their dealings, and saw endorsements and sponsorships as a natural extension of their cricket incomes. That breed changed international cricket forever. 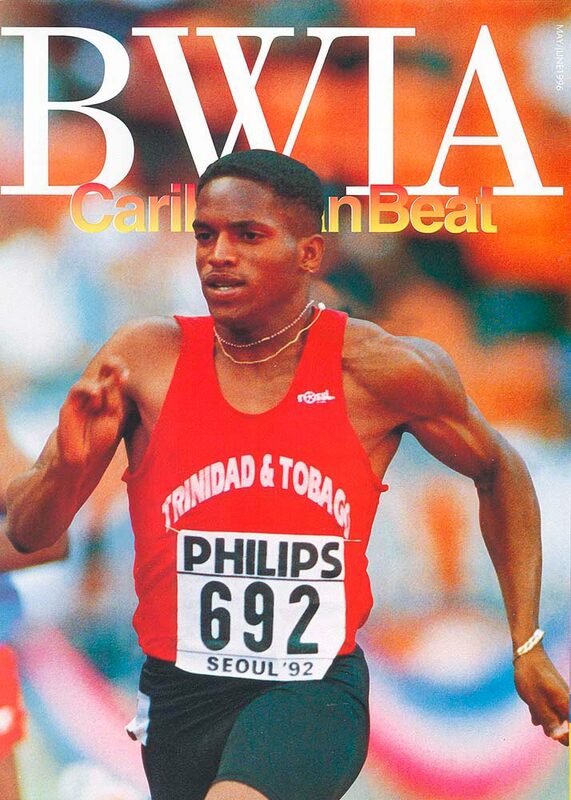 Heading into the 1996 Summer Olympics in Atlanta, Trinidadian sprinter Ato Boldon seemed one of the Caribbean’s best hopes for a medal. A year before, he’d won the 100-metre bronze at the World Championships in Gothenburg — at just twenty-one, the youngest athlete ever to medal in the sprint event. And, indeed, he did take home two medals from Atlanta — bronze in both the 100- and 200-metre races — though precious gold eluded him this time. That wasn’t the case the following year, when Boldon won the 200-metre World Championship gold in Athens, or in 1998, when he took the 100-metre gold at the Commonwealth Games in Kuala Lumpur, setting a still-unbeaten Commonwealth Games record of 9.88 seconds. A serious hamstring injury took him out of the 1999 World Championships, but hopes were high, nonetheless, for further Olympic glory at the 2000 games in Sydney. There, Boldon won the silver in the 100 metres, beaten by US sprinter Maurice Greene (and with Barbadian Obadele Thompson in third place), and the 200-metre bronze. That was to be his final Olympic medal — after a car accident in 2002, Boldon never again ran under ten seconds in the 100 metres or under twenty seconds in the 200. But his Olympic silver and three bronzes still place him in rare company: only three other male athletes have ever won as many or more Olympic individual event sprint medals. And in his post-competition life Boldon has turned his knowledge of the game and on-camera charisma into a thriving career as a television commentator — most recently, Sports Illustrated named him 2016’s best TV analyst for his coverage of the Rio Olympics. Every year, a week before masqueraders take to the streets of Trinidad for the reign of the Merry Monarch, thousands pack into Port of Spain’s Hasely Crawford Stadium for the biggest show in Carnival. The show is Machel Monday. The star: Machel Montano, five-time Soca Monarch, eight-time Road March champ, and the indisputable king of soca. Others have given themselves that title, based on their mainstream success, but none can boast a thirty-five-year career in the art form, practically the same number of albums, or a brand that dominates the Carnival scene — whether or not they are even present. Montano doesn’t wine that much these days. The lithe young man with a waist like butter has now evolved into a sage forty-two-year-old who posts inspirational quotes daily on Instagram. But he still churns out hits to make people dance, think, celebrate, and debate. The key to Montano’s longevity and success has been his ability to change, adapt, and push the limits of his genre, while keeping his eye on his oft-repeated mission to make soca popular and take it to the four corners of the earth. He’s pursued this relentlessly, pushing boundaries, taking risks, and setting trends. He was the first to collaborate with Jamaican dancehall singers, opening the door for them to become staples on the soca scene. He was the first to marry house music with soca on 1995’s “Come Dig It”, later opening the floodgates to EDM soca with “AoA”. He sought international collaborations, teaming up with the likes of Pitbull, rappers Lil John and Wyclef Jean, among others, R&B group Boyz II Men, and South African group Ladysmith Black Mambazo, to name just a few. He’s taken the music far: to Egypt, India, and South Africa, filming videos, meeting songwriters and producers, and looking for sounds to infuse with his. In 2007, he became the first soca artist to headline his own show at Madison Square Garden in New York, and he’s performed on stages at Radio City Music Hall, Coachella, and South by Southwest. To maintain his position atop the pack, Montano — now an elder in the music arena with his thirty-five years’ experience — surrounds himself with young talent: songwriters, producers, musicians, and singers who help to keep his sound fresh and trendy. But nowhere has his evolution been reflected more clearly than in his changing handles. In the early days, his band was known as Pranasonic, named after the Prana Lands area in Siparia, south Trinidad, where Montano grew up. That changed to Xtatik. Then, as he changed the way his band functioned, he assumed the HD persona to reflect his mission to transmit a clearer image of who he is and what he’s about. In 2014, HD made way for Monk Monte. MONK, he said, was an acronym for the Movement of New Knowledge. With the new name came a new role, that of actor. Montano starred in his own film, Bazodee, a Bollywood-style love story set in T&T. In 2016, Bazodee became the first T&T-made film to be distributed in the US, Canada, and across the Caribbean. He’s expected to follow that up in 2017 with a documentary called Machel Montano: The Journey of a Soca King. That journey is far from over. For the foreseeable future, Montano’s crown seems secure. André Tanker’s music might have been washed away in the torrent of soca that floods Trinidad at Carnival every year. But instead it’s outlasted almost all the local music produced since he died in 2003, at sixty-one. Tanker grew up in the middle-class Port of Spain neighbourhood of Woodbrook, home of the Invaders steelband, where he learned to play pan, and the Little Carib Theatre, where Beryl McBurnie was reviving folk dance and Orisha drummer Andrew Beddoe played for Derek Walcott’s Trinidad Theatre Workshop. But Tanker didn’t appreciate them fully until Afro-Trinidadians reclaimed their heritage in the 1970 Black Power Movement. “It gave you a perspective on who you are, what motivates you, why you like what you like,” Tanker said, looking back in 1997. That was when he understood he was entitled to draw on his entire birthright: calypso and reggae, jazz, blues, soul, Latin American music, African and Indian. “Children of a one great love,” he sang. Like many intuitive artists, he wasn’t easy to interview: low-key and laconic, he preferred his message to be conveyed by his music. Likewise, he was more composer than performer, though he played vibraphone and flute, and he sang his songs of love and the oneness of humankind, though his voice wasn’t his greatest asset. Walcott described Tanker’s work as “disciplined enough to be simple”; it was also rich enough to have enduring appeal. Even now, Trinis catch themselves humming “Wild Indian”, “Basement Party”, “Sayamanda”. His talent lay in blending traditions to make something that was at once fresh and familiar. Previewing that year’s FIFA World Cup in our May/June 1998 issue, Georgia Popplewell concluded, “For the first time since 1974, Caribbean people will really have a team to root for.” She was referring to Haiti’s national team, which unexpectedly qualified for the 1974 World Cup in West Germany — and to the Reggae Boyz, the Jamaican national team, which made history in 1998 as the first football team from the Anglophone Caribbean ever to go to the sport’s most prestigious tournament. “For a small country,” wrote Popplewell, “a national sports team is . . . a repository of civic dreams and aspirations.” Such was the case for Jamaica — even if the Reggae Boyz didn’t advance out of the finals’ first round. Five years later, it was Trinidad and Tobago’s chance. Beating Bahrain in a qualifying match, the Soca Warriors booked their tickets to the 2006 World Cup in Germany — and T&T became the smallest nation ever to qualify for the World Cup, a victory in its own right. The Caribbean adores its beauty queens. For a small country, any citizen who wins positive international acclaim is a hero. And our various Misses Universe and World over the decades have also proven to be a talented, enterprising bunch, going on to careers in politics, the arts, and philanthropy. Grenadian Jennifer Hosten (Miss World 1970) later became a diplomat. Jamaican Cindy Breakspeare (Miss World 1976) may be best remembered as Bob Marley’s muse and the mother of his son Damien, but she’s also a successful recording artist in her own right. Her countrywoman Lisa Hanna (Miss World 1993) served as a Cabinet minister. And among the Trinidadians, Janelle Commissiong (Miss Universe 1977) and Giselle Laronde (Miss World 1986) both become successful businesswomen. No wonder, then, that T&T’s Wendy Fitzwilliam, Miss Universe 1998, managed to appear twice on Caribbean Beat’s cover, in July/August 1998 and again less than a year later, resplendent in Carnival costume. Her “reign” was just the beginning: a law student when she won her title, she was later admitted to the bar in her home country, honoured for her activism in HIV/AIDS awareness, recognised as a Red Cross Ambassador for Youth, published a well-received memoir, and now hosts the reality TV series Caribbean’s Top Model — all while maintaining her elegant but down-to-earth presence on T&T’s social scene. 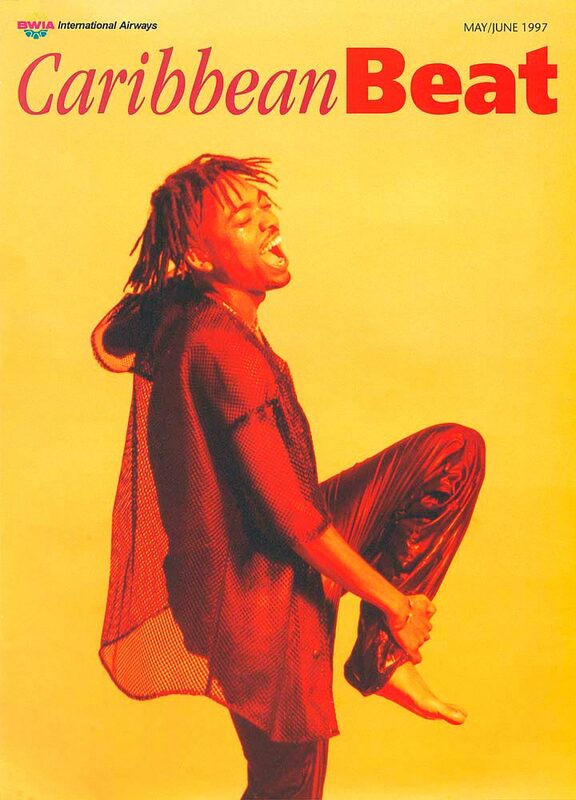 The 1990s were arguably a high point for Barbadian music. The nightclub scene in Barbados was alive and well, and artistes were not afraid to experiment. This decade saw the rise of soca stars like Hinds alongside Rupee and Edwin Yearwood (who’d appeared on Caribbean Beat’s cover two years before); jazz/reggae saxophonist Arturo Tappin; calypso powerhouse Anthony “Mighty Gabby” Carter; and local band Spice and Company, just to start. Creativity seemed to be at an all-time high and the Barbadian sound was one of the leading influences in Caribbean music. Soca dominated the landscape and infiltrated foreign markets, allowing artistes to share their sound with global audiences. Rupee’s “Tempted to Touch” peaked at number 39 on the US Billboard Hot 100 chart and at 44 on the UK singles chart, and featured in the soundtrack of the Hollywood movie After the Sunset. Reggae, hip-hop, jazz, electronic dance music (EDM), and R&B also inspired the style of music performed and created by Barbadian musicians. By the mid 2000s, Barbados was producing international artistes from hybrid genres — Rihanna above all, but also Livvi Franc, Hal Linton, Shontelle, Teff Hinkson, Cover Drive, 2 Mile Hill, and others. Barbadians are proud of their successful musicians, and have created the glamorous Barbados Music Awards and other festivals to highlight, showcase, and honour the wealth of musical talent within the country. Relevance and longevity are always concerns in the industry, and often it’s a battle of legend versus newcomer. Mahalia Cummins, lead singer of the band 2 Mile Hill, says the music scene is once again resurging. “Where support was previously lacking, young and upcoming artistes are working with the more seasoned performers,” she explains. Hinds, our cover subject eighteen years ago, is one such artiste, and she’s always working behind the scenes collaborating with or mentoring younger talent. Most recently, she’s signed up to mentor the young people of the UNICEF Caribbean Junior Monarch Competition, which will launch officially in August this year. Soca is still a main staple in Barbadian music, meanwhile — and with names like Damian Marvay, Nikita, King Bubba, and Joaquin in the current mix, it’s not going to wind up anytime soon. Wining down — that’s a different matter. Boats were a favourite cover subject in the magazine’s earlier years — no fewer than nine in all, ranging from fancy yachts to humble pirogues. How do other categories compare in the rankings? Three covers have depicted botanical subjects, and three have featured children playing on beaches. Seashells? Two. Surf-, windsurf-, and kite-boards? Three. Rivers? Five. At the other end of the scale: sportsmen and -women? Eighteen. Musicians? Twenty-four. We aren’t called Caribbean Beat for nothing. Every photographer on assignment for a magazine wants the cover. It’s prime space and usually pays the best, but a portrait session can go off the rails if there isn’t a good, balanced range of images for the publication’s designer to work with. That means putting effort into making every setup as compelling as possible, while thinking about how they play together to offer their own visual narrative in the final piece. Ideally, the photographs complement the words in a profile. Sometimes they tell a parallel but unrelated story. At worst, they exist in a different world from the words. The cover photo has work to do. It is a preview of the issue’s tone and content, a sales pitch to the potential reader, and an invitation to read the story it references. My first preference with a subject is almost always an environmental portrait. If it can happen effectively in the subject’s space, they begin with the advantage of home ground in the encounter. The Mungal Patasar session happened at his home. The musician lives in the countryside, and I imagined great possibilities. 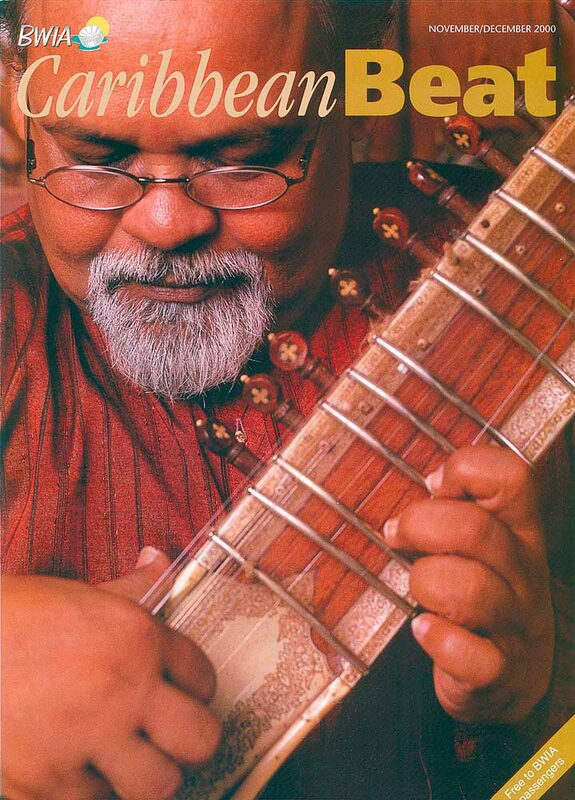 I photographed him in his living room with his family and, with time running out, in a nearby field seated with his sitar under a tree. But it was the portrait taken just a few inches from the front door of his home — a heavy, weathered slab of wood with just enough texture and muted tone to complement the musician and his well-used instrument — that ended up leading the issue. After some broad direction about posture, Mungal began to play. I wish I could say I was an appreciative audience, but I had one roll of 120 Fujichrome 50 allocated for this shot, twelve frames on the Hasselblad I was using, and I needed to bracket exposures. Mungal just played on, doing his work while I did mine, a portrait more passionately given than taken. 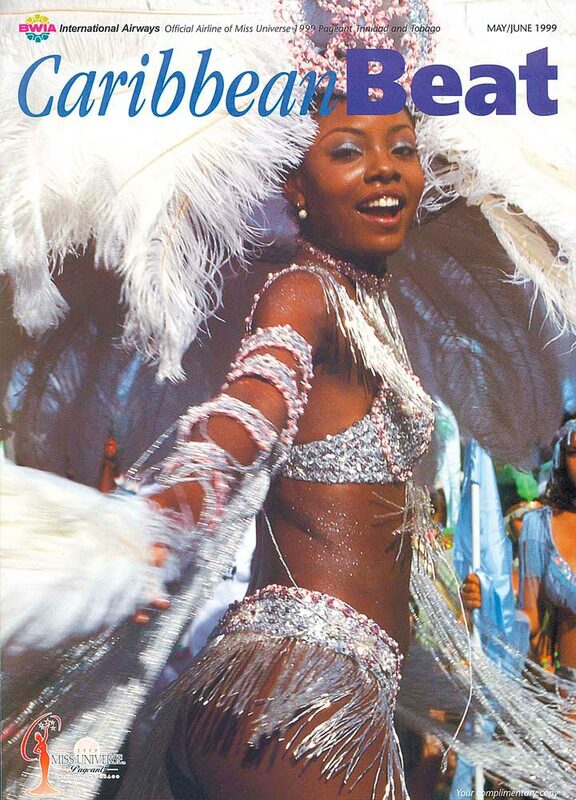 Our twenty-odd Carnival cover subjects have included sequined pretty mas, calypso and soca stars, traditional characters like the blue devil and Dame Lorraine. Mas is one of the hardest subjects to capture in a single image: it’s chaotic, it’s unpredictable, it moves too fast. Over two and a half decades, we’ve profiled dozens of our region’s best writers — novelists, poets, dramatists, biographers. We’ve run in-depth features on Nobel laureates and talented up-and-comers. Our first story on Jamaican Marlon James ran in 2006, nine years before he won the Man Booker Prize; we profiled Trinidadian Vahni Capildeo, winner of the 2016 Forward Prize, back in 2004. But in twenty-five years, only one writer has appeared on the cover: Grenada-based Oonya Kempadoo, profiled in March/April 2002. Kempadoo had made an auspicious debut three years before, with her novel Buxton Spice, which set off a fabled “bidding war” among London publishers. Tide Running soon followed. And her third novel, All Decent Animals, was imminent, our 2002 article predicted. Except it was another decade before it actually appeared. 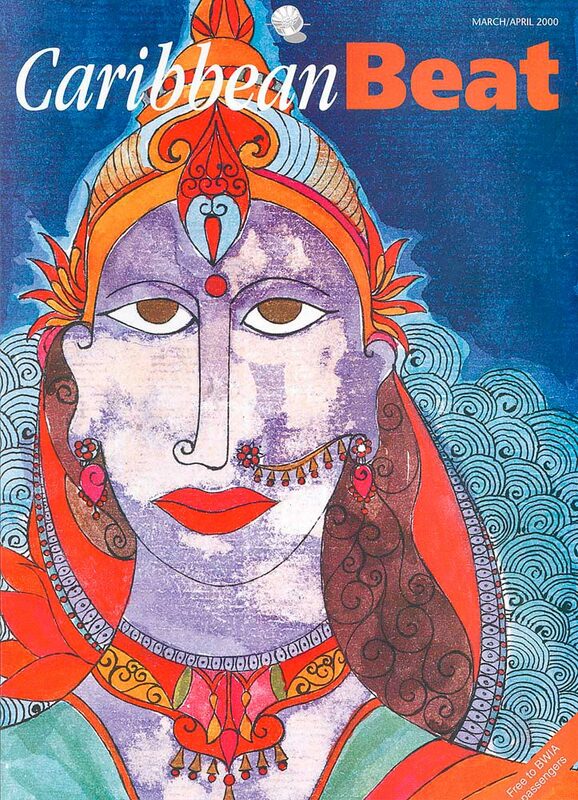 Our readers got a preview in our May/June 2013 issue, when we published an excerpt from the long-awaited work. It’s one of the permanently contentious issues of public debate in the Caribbean: the state of West Indies cricket. Over the lifetime of Caribbean Beat, fans of the game have argued and agonised over the regional team, its players and administrators, and wondered if the West Indies will ever return to the form of its glory days in the 1970s and 80s. In our May/June 2003 issue, we took a stab at predicting what a future version of the West Indies team might look like. After talking to experts at the West Indies Cricket Board and regional cricket associations, we compiled our “next 11”: a lineup of exceptional young cricketers under seventeen years old, who seemed to have the talent and attitude. So how solid were our predictions? Of our eleven youngsters, one — Marcus Julien of Grenada — switched sports, to football. Most of the others went on to play for their national under-17 or under-19 teams. A handful — including Kavesh Kantasingh of T&T and Javal Hodge of St Kitts and Nevis — have played for their national senior teams. And two have represented the West Indies at the highest levels of the game. Trinidadian batsman Jason Mohammed made his first-class debut for T&T against Jamaica in 2006. And in December 2011 he played his first One Day International match for the West Indies, versus India. He subsequently represented both T&T Red Steel and the Guyana Amazon Warriors in the Caribbean Premiere League T20 regional tournament. Meanwhile, Barbadian batsman Omar Phillips found himself batting for the West Indies in a 2009 Test match against Bangladesh. A contract strike by several members of the regional senior team saw seven young players selected for that Test series. Phillips came just six runs short of a debut century. 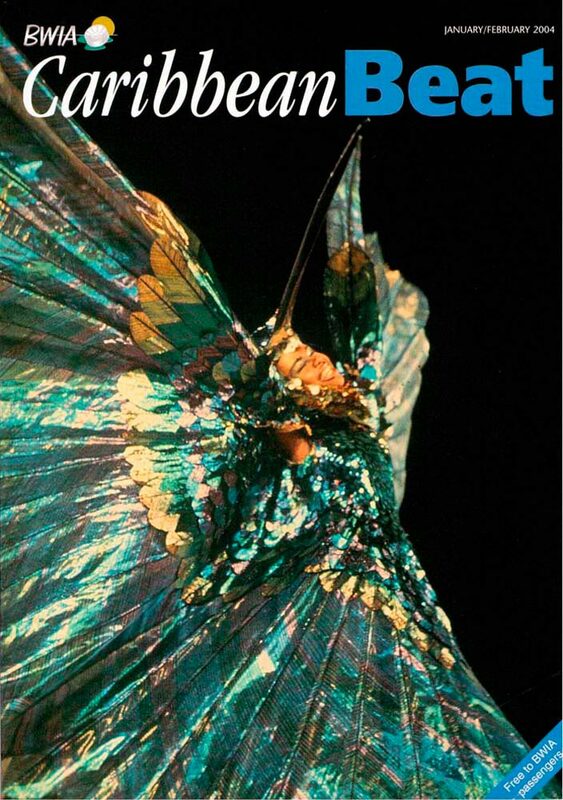 It’s one of the most iconic Carnival photos of all time, perfect for the cover of our issue profiling thirteen designers from the golden age of mas: Peter Minshall’s 1974 costume From the Land of the Hummingbird, portrayed by Sherry-Ann Guy and captured on film by the late Roy Boyke. The most celebrated and controversial masman in T&T Carnival from the time of his debut in the mid 1970s, Minshall himself had appeared on the cover of our third issue, back in 1992. On two other occasions, photos of his creations made striking cover subjects: our September/October 1998 issue featured a costume from his band Red, and a bird-garbed masquerader from Picoplat appeared on our January/February 2003 issue. Caribbean Beat’s most extensive take on Minshall’s career came in our May/June 2006 issue, when a profile by editor Nicholas Laughlin was accompanied by personal accounts from some of the artist’s closest colleagues and observers. In an irony of timing, 2006 also turned out to be the final year in which Minshall produced a full-scale Carnival band. But a handful of smaller subsequent mas collaborations have continued to astound and provoke his audience. Witness the drag-ballerina Dying Swan costume he designed for the Carnival Kings and Queens competition in 2016, which set off a firestorm of debate unlike anything since — well, since the last Minshall controversy. Genius remains restless. 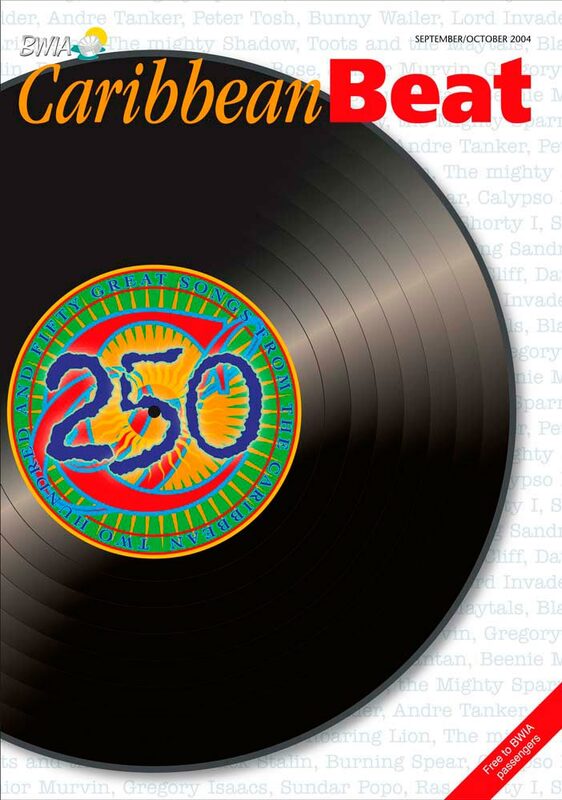 In perhaps the most ambitious feature Caribbean Beat had yet published, we polled a panel of music experts and came up with a list of 250 great songs from the Caribbean — most of them from the pre-digital era, as suggested by the vinyl record on the cover. 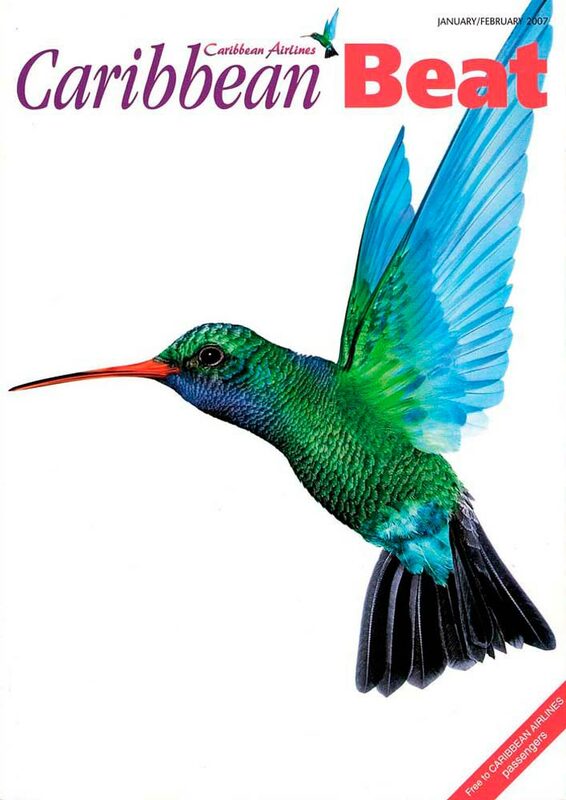 At midnight on 1 January, 2007, BWIA — Caribbean Beat’s airline partner for fifteen years — ceased to exist, and Caribbean Airlines was born, welcomed by a cover featuring the colourful hummingbird from the new airline’s logo. “It always seemed glamorous,” said Rihanna early on in her career, “but it is real work.” Talent and luck have something to do with it, too. A nineteen-year-old relative newcomer when she appeared on the cover of the September/October 2007 Caribbean Beat, the Barbadian singer-songwriter was then two years into a stellar international career. 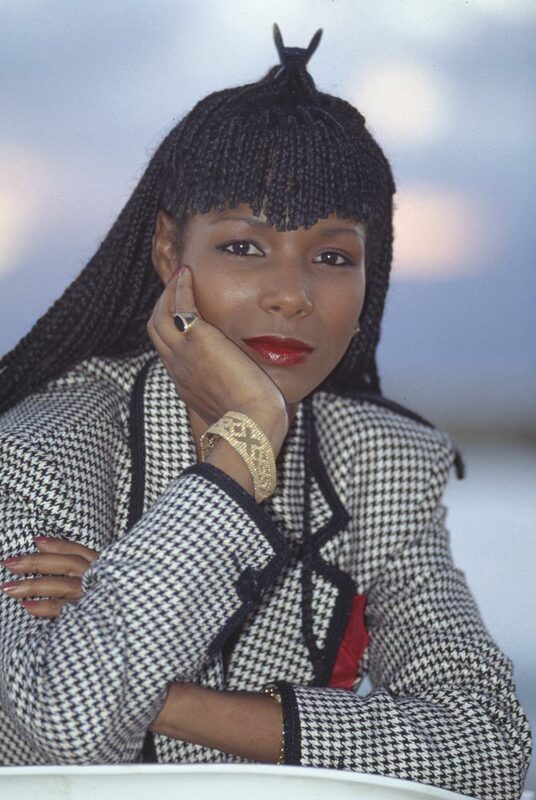 A decade later, she’s indisputably the top selling digital artist of all time, winner of eight Grammy Awards, among numerous other honours — also a fashion icon, movie star, named one of 2012’s “100 most influential people in the world” by Time magazine, and an astute businessperson: in 2015 she created her own label, Westbury Road Entertainment. “Whenever I get the chance, I fly home to Barbados,” Rihanna said, interviewed in Caribbean Beat by writer Essiba Small. And her contributions to her home island go beyond the reflected blaze of her pop-star celebrity. In 2012, Rihanna made headlines when she donated US$1.75 million to the Queen Elizabeth Hospital in Barbados, in memory of her late grandmother — the namesake of Rihanna’s Clara Lionel Foundation, which she founded to “improve the quality of life for communities globally in the areas of health, education, arts, and culture.” An unapologetic force to reckon with, the first-ever recipient of the American Music Awards Icon Award is now working on her ninth studio album. Arguably the Caribbean’s most famous icon, Bob Marley was the cover subject of our May/June 2001 issue, on the twentieth anniversary of his death. His legacy lives on through his music, familiar to fans around the world — and though his children and grandchildren, many of whom inherited Marley’s musical genes. 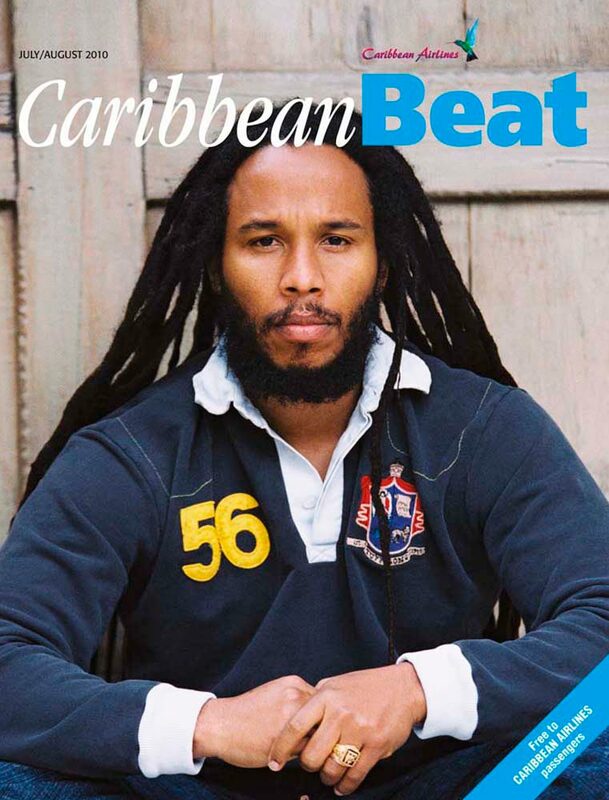 Like first-born son David “Ziggy” Marley, who appeared on the cover of our July/August 2010 issue. Last year, Ziggy released his fifteenth album. There are also rumours of new albums in the works from both Damien and his brother Julian. Meanwhile, the rest of the family is involved in various Marley-branded projects, from fashion to cooking, graphic design to electronics, and of course running the Bob Marley Museum in Kingston. There’s a line of Marley coffee — including beans grown in the Blue Mountains of Jamaica and the highlands of Ethiopia — and eco-friendly footwear. Whatever else you can say of the Marley family, they understand the value of their family legacy. Back in 2010, three of the directors I highlighted had just made their debut features: Maria Govan (Rain) and Kareem Mortimer (Children of God) of the Bahamas, and Jamaica’s Storm Saulter (Better Mus’ Come). As I write this, Govan’s second effort, Play the Devil, is winning plaudits on the festival circuit; Mortimer’s third film, Cargo, is about to premiere; and Saulter is in post-production on his follow up, Sprinter. Other talented filmmakers have joined in the act. The blessings of the digital revolution notwithstanding, making films in the Caribbean remains a challenging business. The biggest challenge, however, still is winning over hearts and minds to the idea that there’s more to cinema than the Hollywood formula. 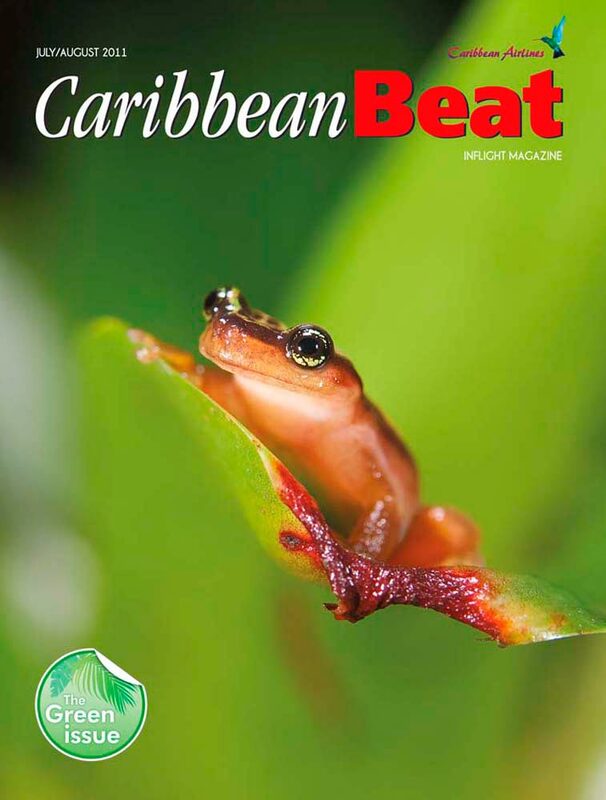 Caribbean Beat’s special “Green Issue” featured a rare frog species on its cover — the only time an amphibian has served as cover model. Fauna cover subjects have also included one non-human mammal and four birds — can you spot them all? Heading into the 2012 Summer Olympics in London, the eyes of the world were on Usain Bolt — understandably, considering how the Jamaican sprinter had overwhelmed the competition in Beijing four years earlier. But astute observers — like writer Kwame Laurence, who wrote the cover story on Caribbean Olympic prospects for our July/August 2012 issue — had their eyes on other contenders as well. Like Grenada’s Kirani James, then just nineteen years old, who a year before at the World Championships had become the youngest ever 400-metre gold medalist. 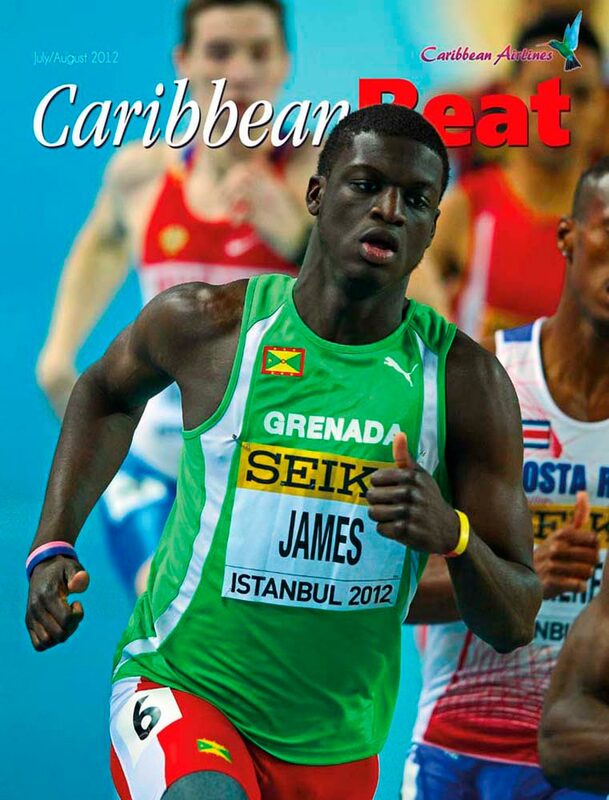 “He has all the expectations of Grenada resting on his shoulders,” wrote Laurence. 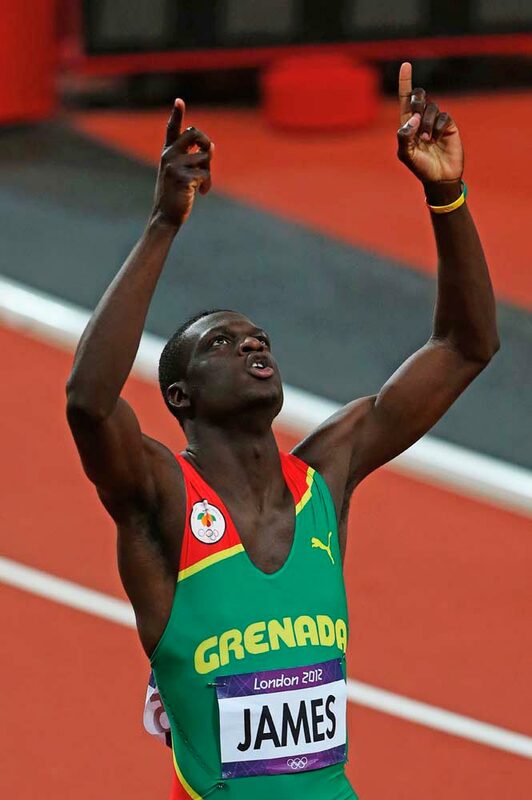 And on 6 August, 2012, those expectations were fulfilled: thanks to James, Grenada’s first-ever Olympic medal was gold. Five of the eight lanes in the final were occupied by Caribbean athletes, plus all three spots on the medal podium — with Luguelín Santos of the Dominican Republic in second place and Lalonde Gordon of T&T in third. James’s welcome back to Grenada — and his home village of Gouyave — was euphoric. 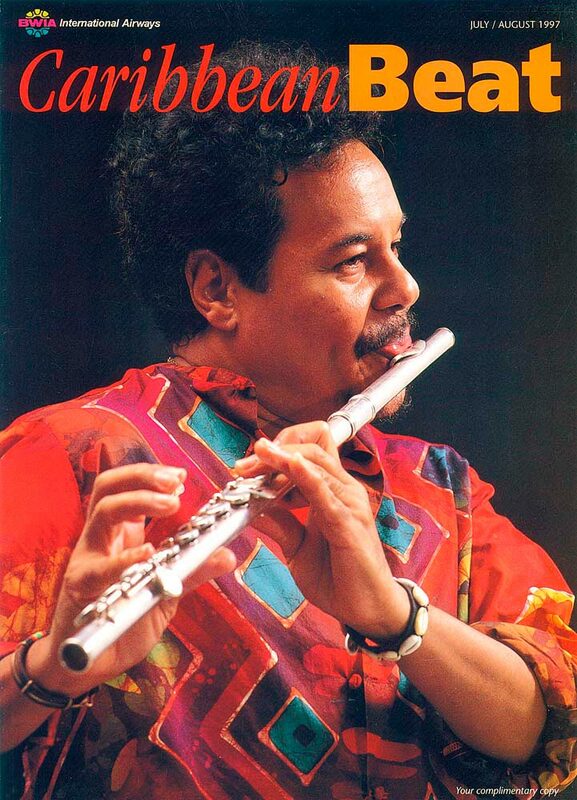 And Grenadian readers of Caribbean Beat were delighted the magazine had the foresight to put him on the cover. How did we make the call? “I think it was a mixture of reasons,” remembers Judy Raymond, then editor. “We wanted to use a photo of someone promising but not too familiar, and from somewhere that didn’t already have a great Olympic track record. And we had a good pic of him.” The confidence of writer Kwame Laurence — one of the Caribbean’s most experienced sports journalists, specialising in track and field, and a longtime contributor to the magazine — about James’s promise also helped. Four years later, at the 2016 Rio Olympics, James was a favourite to repeat his win. Only one athlete — American Michael Johnson — had ever managed to defend an Olympic gold in the men’s 400 metres, in 1996 and 2000. But the achievement just barely escaped the Grenadian champion. James came second, to Wayde van Niekerk of South Africa — but still brought home Grenada’s second-ever Olympic medal, and singlehandedly gave his country the highest number of Olympic medals, per capita, at two successive Summer Games. 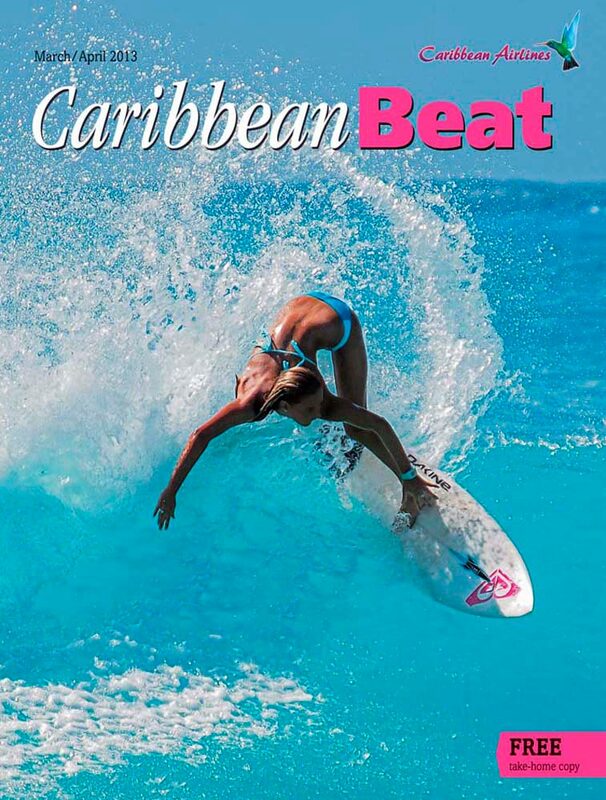 Just seventeen when she appeared on the cover of the March/April 2013 Caribbean Beat, slicing through a wave, Chelsea Tuach already had four years’ experience as a national and regional surfing champion. Starting at the age of ten, Tuach is the youngest surfer to represent Barbados in the watersport, and the most successful in competition. Ranked fourth in the world in 2015, she’s twice won the World Surf League (WSL) North American Junior Pro Championships. Tuach has flown the Barbadian flag in Australia, Brazil, El Salvador, Fiji, Mexico, Spain, France, and Japan. “I set goals, seize opportunities, and with a lot of faith and support, I’ve managed to do it,” she says. She’s had moments of self-doubt and at times intimidation, going up against older competitors. But nothing has stopped her burning spirit of determination, especially backed with resounding support from her island. The old adage “you can’t judge a book by its cover” doesn’t apply to magazines. 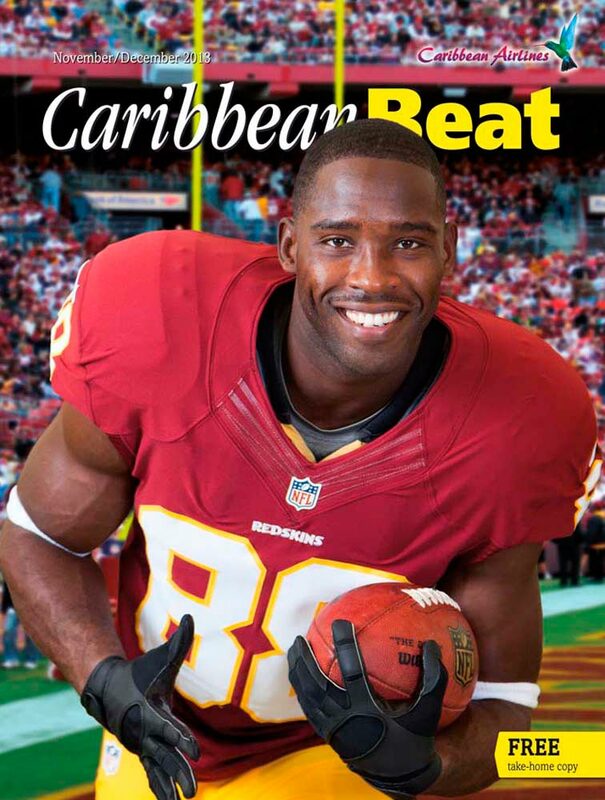 When “From island to end zone”, profiling NFL football players with Caribbean roots, hit the Internet, Caribbean Beat’s website got thousands of hits in the first hour — enough to crash the site temporarily. The Washington Redskins and its star wide receiver Pierre Garçon had retweeted the story, and it was read by legions of fans. Garçon spoke about his Haitian roots and his continuous ties with the Caribbean island — and his friendly smile lit up the cover photo. Garçon hasn’t skipped a beat since his Caribbean Beat profile. He finished his five-year, US$45-million contract with the Redskins and became a free agent. At thirty-one, he showed no signs of slowing down. He’s been a consistent play-maker for the Redskins throughout all the team’s travails with its numerous quarterbacks. Then when Hurricane Matthew hit Haiti last year, Garçon’s team sent him to Haiti as an extension of his prolific community service work, and the NFL chose him to represent his team for the Walter Payton Man of the Year award, which pays homage to NFL players who engage in community service. Meanwhile, Jamaica-born Patrick Chung, also featured in the story, left the Philadelphia Eagles and returned to the New England Patriots to play for Bill Belichick, considered one of the most difficult and challenging coaches in the NFL. Chung soared, figuratively and literally, with high-flying tackles at the free safety position, which stunned opponents’ offenses. Belichick deemed Chung a crucial, versatile player who excelled at any defensive position where he was slotted. And Jamaica-born Trevardo Williams, a fourth-round draft pick and rookie for the Texas Texans, suffered an injury that prevented him from playing most of the season with the Texans. He made the rounds of the NFL, and landed eventually in the Canadian Football League (CFL), playing for the Toronto Argonauts. What’s the exemplary colour of the Caribbean? Many would say blue, in all its hues: the colour of the sea that surrounds our islands. There’s something about that tropical marine blue that lifts the spirits: no wonder blue waters have appeared on no fewer than seventeen of our covers over the years. This freshly painted chattel door caught my eye as I was driving past, and I just had to stop and capture it. 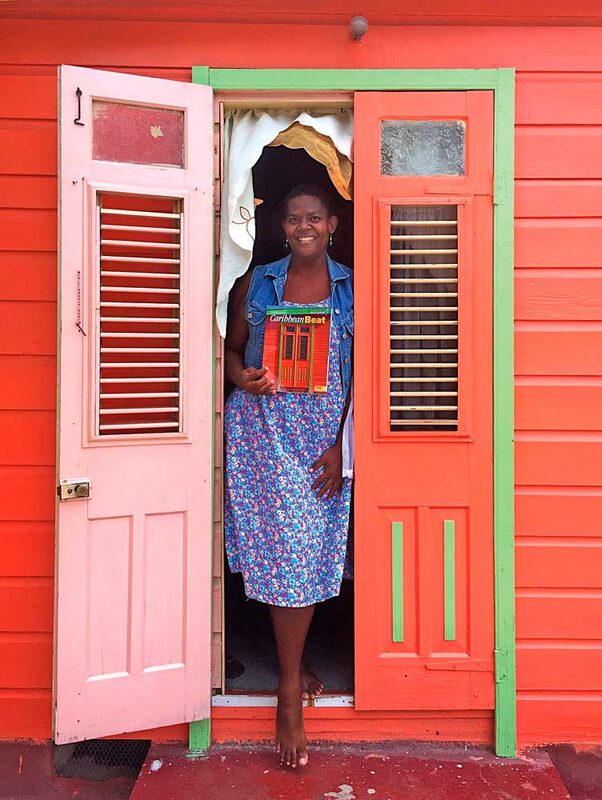 We have a history of finely crafted chattel houses in Barbados. More recently we started using bright colours rather than the traditional brown of past times — orange and green being a popular colour combination in Bim. Imagine my delight when my chattel house door ended up on the cover! On receiving the magazine, I kept it for a few days, then decided the people who live in the house should have it. Having never met them, I drove over and knocked. Lisa came to the door. And her mum. And her son. They were all delighted. I had already planned to “pay it forward,” so gave Lisa a percentage of what I earned for this photograph. Lisa emotionally told me that the money had come at just the right time. She hugged me. Gran hugged me, and Son told me I had to hug him too. So, hugs all round, all of us crying and laughing. I have now met three more wonderful Bajans in my island. Feels good. Feels right. 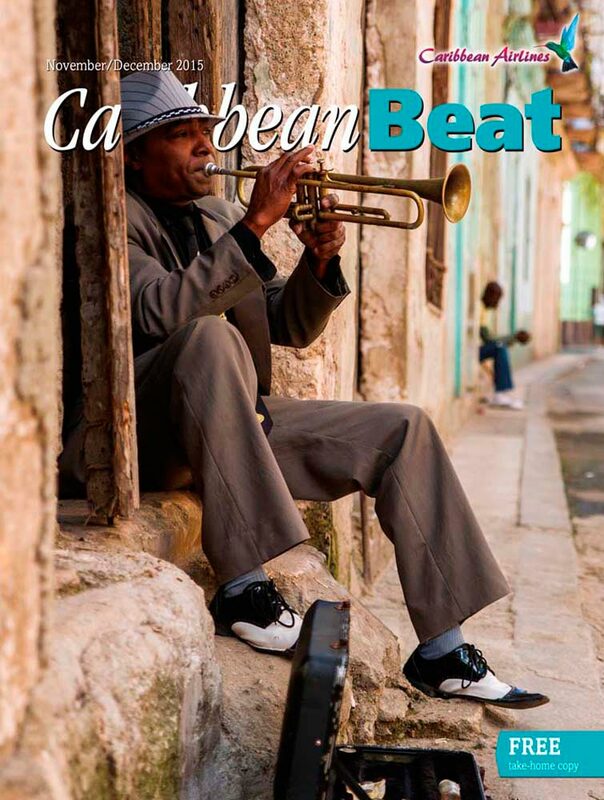 A Cuban street musician — performing a trumpet solo, snazzily attired in brown suit and two-tone shoes — was the cover subject of our November/December 2015 issue. It was a favourite of Dionne Ligoure, head of corporate communications for Caribbean Airlines, and a longtime reader of the magazine. 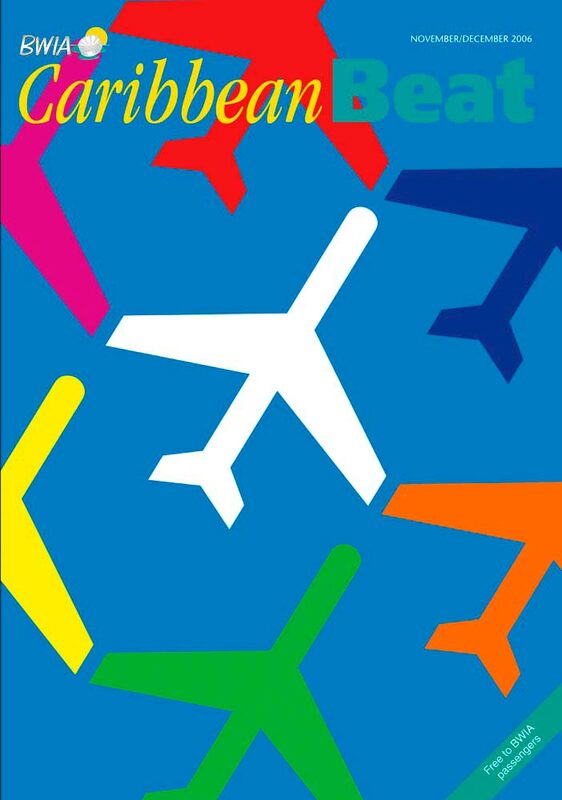 In fact, Ligoure keeps a copy of this cover on display in her office at the airline’s headquarters. And what does Caribbean Beat mean to her, and the airline? I’m tremendously proud of the magazine,” Ligoure says. 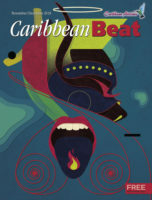 “For the past twenty-five years, Caribbean Beat has featured, documented, archived, and highlighted the accomplishments of Caribbean icons throughout the region and our diaspora. Sometimes it’s tough deciding among the options for a cover subject — and sometimes there’s no contest. That was exactly the case with our July/August issue last year, timed with the 2016 Summer Olympics in Rio de Janeiro. “No contest” also describes how some of the world’s best sprinters must have felt, knowing they were up against Usain Bolt in the men’s 100- and 200-metre events. Born in rural Trelawny Parish, Jamaica, in 1986, Bolt is the fastest human being on record, and considered the greatest sprinter of all time. Where track and field are concerned, the past decade has indisputably been the Age of Bolt, and it’s hard to imagine another athlete so dominating the sport in the near future. 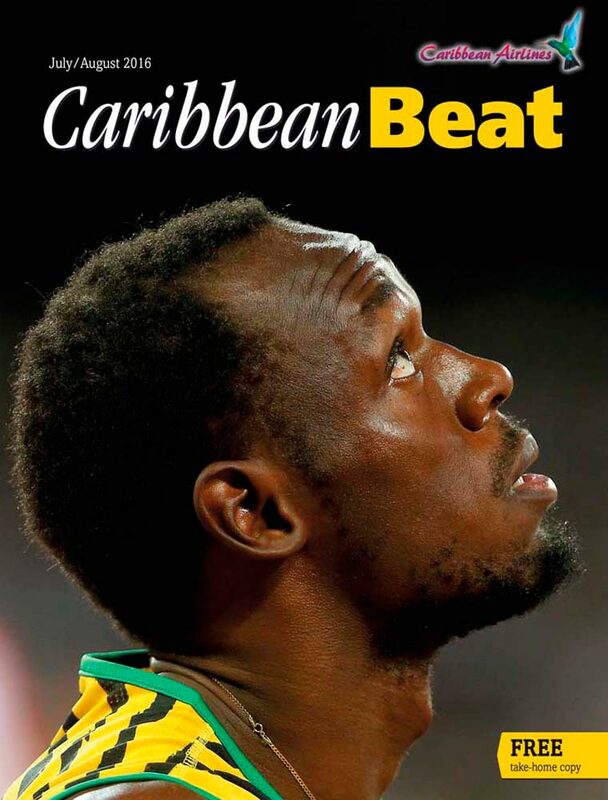 Few people could have predicted this unprecedented victory streak back in 2004, when Bolt — then just shy of his eighteenth birthday — appeared in the pages of Caribbean Beat for the first time. But it was already clear he was a major talent — writer Kwame Laurence called him one of the fastest men alive, previewing the Caribbean’s medal hopefuls in the Athens Olympics. Slowed by a leg injury, Bolt didn’t make it past the first round of heats. But he was just getting started. Heading to the 2012 London Olympics, Bolt was a clear favourite — both with the crowds, who loved his high-spirited antics, and to repeat his wins. He didn’t disappoint. For Jamaicans, the timing of the achievement was especially significant, coming in the very month when the nation celebrated its fiftieth anniversary of Independence. “I’m now a legend,” Bolt remarked, matter-of-factly. But the truly legendary feat was in Rio in August 2016. “This will surely be his last Olympic Games,” wrote Kwame Laurence, “and he’ll do everything in his power to ensure a golden farewell.” No athlete had ever won the 100-metre event at three consecutive Olympics, nor the 200 metres. To win them both — a “triple double” — would once have been unthinkable. But not, as it turned out, for Usain Bolt. Our oldest cover subject in twenty-five years? 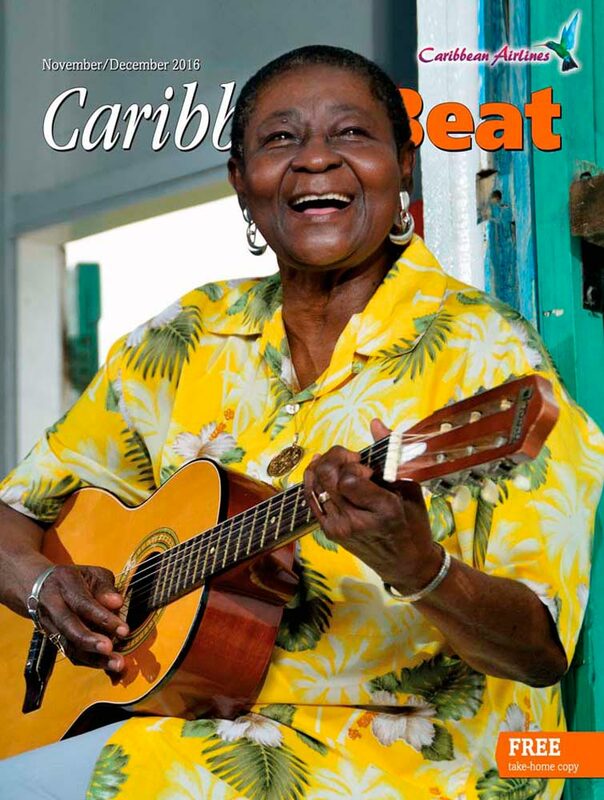 That would be Linda McArtha Sandy-Lewis, the indefatigable Calypso Rose, who was seventy-six when she fronted our November/December issue last year. And in this case, age isn’t just a number, or a bit of trivia — it’s evidence of the longevity of one of the most extraordinary careers in Caribbean music, dating back to the 1950s. When the Tobago-born calypsonian started her career as a teenager, calypso was still a macho genre. That she ascended to the heights of the artform is tribute to her skill as a singer and composer, her warmth and sincerity on stage, her wicked lyrics and playful performance style. Audiences adored her, but it wasn’t until 1978 — more than two decades into her career — that she won calypso’s highest honour. They had to literally rename the Calypso King title for her sake. The same energy, talent, and dedication that earned her that groundbreaking accolade are also responsible for the remarkable resurgence in popularity Rose has experienced in her eighth decade. Her latest album, Far from Home, was a surprise hit of summer 2016 in Europe, winning her thousands of new fans and a growing number of international awards, as she keeps to a touring schedule many younger musicians would envy. And her tune “Leave Me Alone” — featuring a guest appearance by Machel Montano — was yet another hit on the road at Carnival 2017. 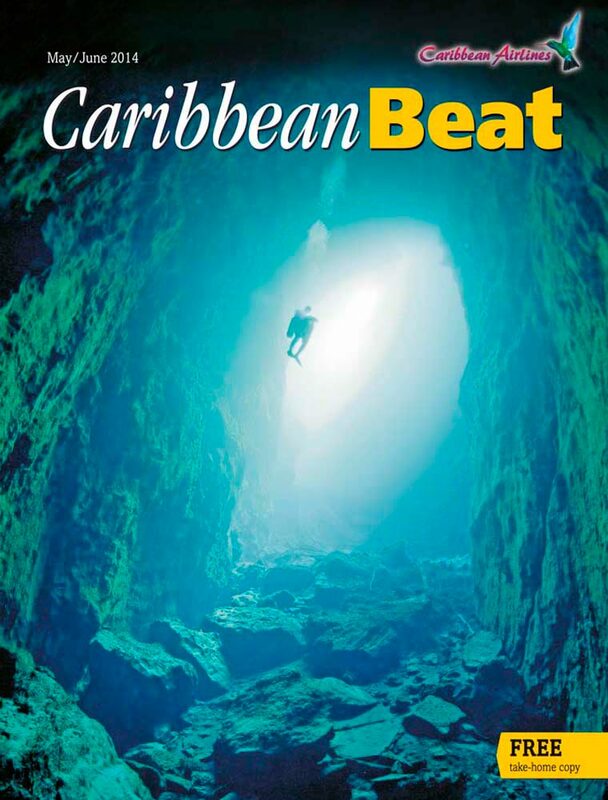 Caribbean Beat has always been free for Caribbean Airlines (and, before that, BWIA) passengers to take home — and many of you have done just that, collecting each issue as it appears on planes. A full set of all 144 magazines published to date takes up about two and a half feet of shelf space (and weighs almost a hundred pounds — yes, we checked). Readers hold on to them because many of the articles, profiles, and interviews are worth revisiting, even decades later. Researchers make reference to the magazine and teachers use it in classrooms. But if you haven’t been a Caribbean Beat reader and collector since 1992 — or if you don’t have two and a half feet of shelf space to spare — you can still access our rather vast archive via our website. The magazine first went online circa 1998. Back then, in the days when no one knew as yet what the World Wide Web would turn out to be, only a handful of articles from each issue were posted online, and some HTML hand-coding was involved. It’s a lot simpler these days. Not only can you read the full contents of each new issue online, you can also search all the way back to issue number one in a matter of seconds — if, say, your heart is set on finding every single reference to Machel Montano we’ve ever published. Now, the archive is a work in progress — we’re still digitising some of the earlier issues. 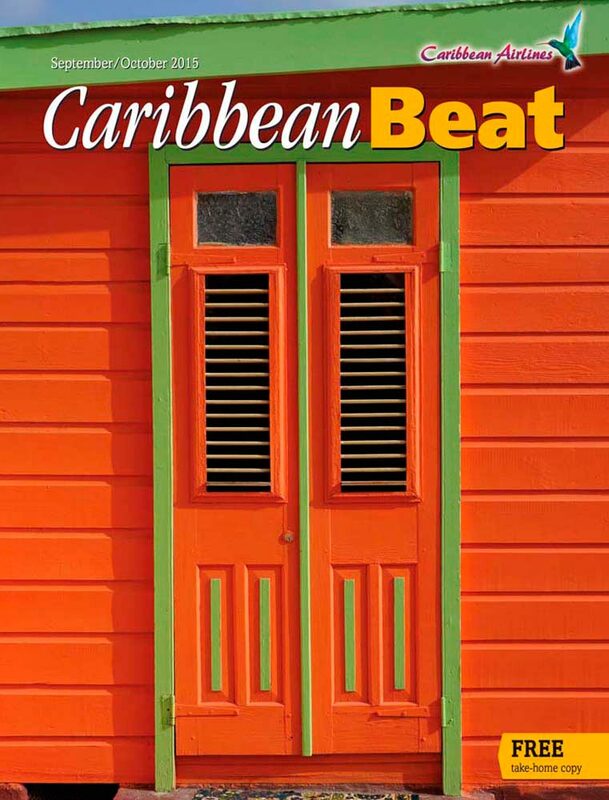 Even so, there are close to 2,500 articles already available, which makes the Caribbean Beat website one of the most extensive free online archives of Caribbean culture. Even for our editorial staff, exploring this archive is always an adventure of discovery and re-discovery. 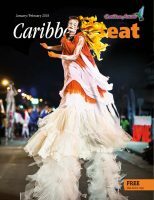 Find it all at caribbean-beat.com.